Over the course of history the emergence of unorthodox clothing styles has revealed much about the social norms governing appearances. New ideologies concerning spirituality, health, hygiene, and gender have not only subverted existing social boundaries but also shaped the trajectory of fashion in the process. Quakerism, Bloomerism, aesthetic dress, and Jaeger dress may be examined as catalysts for both fashion and social change. Another revolutionary movement within the history of fashion involved the promotion of a healthy and rational approach to dress. During the eighteenth century, various medical professionals gradually began to question the irrational and unhealthy nature of the existing fashionable garments. Many argued that corsets and heavily layered undergarments restricted movement, crippled the spine, and harmed internal organs. As a consequence, certain medical professionals began to encourage men and women to turn their attention away from aesthetics and toward their health. During the 1880s, Dr. Gustav Jaeger, a German Professor of Physiology and Zoology at the University of Stuttgart, promoted what he believed to be a healthy alternative to conventional dress. In 1884 Dr. Jaeger developed a unique system of dress based on the belief that wearing undyed sheep wool against the skin would enable skin to breathe freely and prevent perspiration. Dr. Jaeger recommended avoiding clothing made of silk, cotton, or linen-or any cloth which had been dyed. He was also highly critical of the corset. The nonconformist apparel Dr. Jaeger introduced was designed to follow the contours of the body closely, so as to prevent exposure to drafts that he believed dangerous to the health. Jaeger was best known for undyed woolen undergarments for both sexes, including chemises, petticoats, and breeches. The range was later expanded to include other items of clothing such as jackets and trousers, as well as bedsheets. The protective properties of woolen undergarments were widely promoted. Dr. Jaeger was an exhibitor at the International Health Exhibition of London in 1884. He also published widely and released a book in 1887 titled Essays on Health Culture. Although the Jaeger mode of dress was targeted to all, it initially only acquired a minority and predominately middle-class following. As the system gained gradual acceptance however, London retailer Lewis Tomalin purchased the name and opened a store on London's Regent St. As public interest in health and comfort progressed, Lewis Tomalin gained popularity among male and female consumers alike. Competitive retailers gradually became aware of the changing social consciousness and began producing varied ranges that expanded upon Jaeger's original ideologies. By the 1920s, however, the popularity of Dr. Jaeger's undergarment designs gradually began to wane as fashions became increasingly fitted. Nevertheless, the adoption and persistence of his health-reform movement illustrates that a portion of society was prepared to choose clothing primarily on the grounds of supposed health benefits rather than fashionability. In the nineteenth century, as male clothing became increasingly utilitarian, certain women began to feel constrained by the fashionable clothing styles available to them. The most famous dress-reform movement was called Bloomerism. The movement was named after New York resident, Amelia Jenks Bloomer. In 1851 Bloomer published an article in the feminist publication she edited called The Lily, stressing the importance of introducing reformed garments for women. The article was later reprinted in popular American press and gained a widespread readership. Later that year, along with her friends Elizabeth Smith Miller and Elizabeth Cady Stanton, she was seen in public dressed in a shortened skirt with Turkish trousers. Although Amelia was not the first woman to wear or invent the garment, the name evolved as a consequence of her association with The Lily. The bloomer costume consisted of loosely fitting, Turkish-style trousers that gathered and frilled at the ankle with an elasticized cuff. 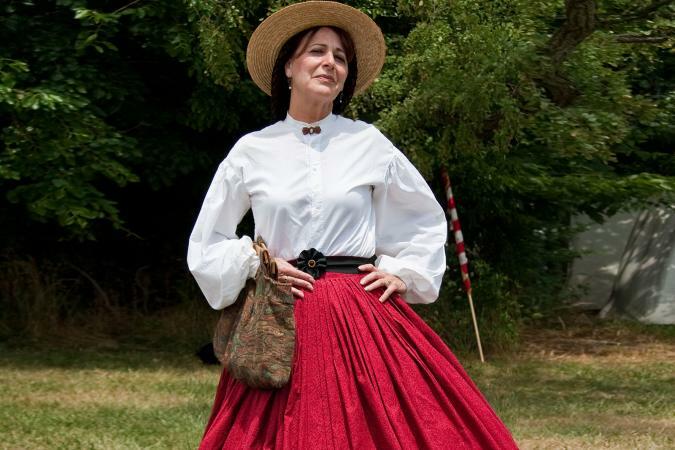 The trousers were worn beneath a shortened skirt that fell below the knee, and a fitted bodice. In contrast to the prevailing fashions, the outfit was claimed to be comfortable, convenient, safe, and healthy. Bloomer dress focused not on the way one looked, but rather on the way one felt. The original intention of the garment was thus not to challenge established gender boundaries, but rather to increase mobility and function. Amelia Bloomer had herself discarded the costume by the mid-1850s. Although the movement was short lived, it exposed entrenched gender stereotypes and challenged the dominant ideals of femininity. As a consequence the innovative costume signaled an advance in the direction of female emancipation. The bloomer costume was revived through the establishment of the Rational Dress Society in London during the 1880s. The Society was chaired by Viscontess Haberton and sought to advocate the development of a rational system of clothing. During the late 1880s, the Society started publishing the Rational Dress Society Gazette that campaigned against restrictive fashions. One of the main premises of the Society was the belief that women should forsake heavy undergarments and corsets, as such items restricted movement. In later years members adopted short jackets with bifurcated knee-length skirts, as it was believed such garments enhanced physical mobility. The introduction of new sports such as bicycling and lawn tennis greatly assisted the growing tendency toward functional clothing. In these arenas bifurcated garments became an acceptable mode of sports dress. During the same period, the Aesthetic Movement began to emerge out of the field of decorative arts. Aesthetic devotees encouraged women to discard the restrictive garments in vogue and adopt loose-fitting, "artistic" apparel instead. The style of dress was inspired by the work of Pre-Raphaelite painters such as Rossetti and consisted of loosely draped, medieval-styled robes. The style appealed to a significant number of middle-class women. Oscar Wilde was an avid supporter of the movement. In London, the Liberty Company produced aesthetic dresses. In the early twentieth century, reform styles influenced the fashions created by avant-garde designers such as Paul Poiret and Mariano Fortuny. See also Aesthetic Dress; Bloomer Costume; Corset; Fashion Gender and Dress; Liberty & Co; Politics and Fashion; Religion and Dress. Crane, Diana. Fashion and its Social Agendas: Gender, Class and Identity in Clothing. Chicago and London: University of Chicago Press, 2000. Etten, Henry Van. George Fox and the Quakers. London: Long-mans, 1959. 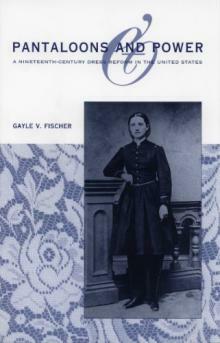 Fischer, Gayle V. Pantaloons and Power: A Nineteenth-Century Dress Reform in the United States. Kent, Ohio, and London: Kent State University Press, 2001. Gattey, Charles Neilson. The Bloomer Girls. London: Femina Books, 1967. Newton, Stella Mary. Health, Art and Reason: Dress Reformers of the 19th Century. London: John Murray, 1974.